While the Napa Valley may be best known for its more than 400 wineries and farm fresh menus to complement each glass or bottle of wine, its temperate climate and breathtaking views also makes the destination an ideal venue for outdoor concerts. The Napa Valley provides a variety of opportunities to enjoy live music and the great outdoors in a variety of gorgeous venues. Live concert events are scheduled throughout the Napa Valley year round, with something for every musical taste. BottleRock Napa Valley – Held each year in May, BottleRock Napa Valley is quickly becoming one of the country’s premiere music festivals. The three-day festival features some of the world’s top musicians on four music stages, plus a BottleRock Culinary Stage showcasing one-of-a-kind culinary and celebrity pairings. BottleRock offers the best in wine, food and craft brews to complement the music and create an authentic wine country experience for festival guests. Festival Napa Valley – This high-end festival runs ten days each July, and features International luminaries in classical music, from vocalists to orchestral groups, to dance. Performances are held at some of the most spectacular wineries throughout the valley, accompanied by premium cuisine and wines. 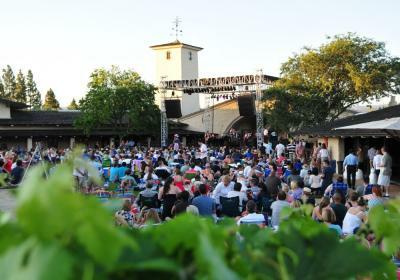 Robert Mondavi Summer Concerts – For nearly 50 years, the Robert Mondavi concert series offers headlining musical entertainment every Saturday in July on the sprawling grass terrace of the iconic winery. Long Meadow Ranch’s Bluegrass-Fed Concerts – This intimate family venue in St. Helena features country, blues, and rock performers each summer through October. Beringer Vineyards Summer Music in the Backyard – This historic winery, founded in 1875, offers live music each summer weekend through the early fall from 12:30 to 4:30 p.m., complete with picnicking on the great lawn. The Sherry Shack is open for purchasing picnic items and wines by the glass from 11 a.m. to 5 p.m. Visitors are encouraged to arrive early to reserve a picnic spot. A Bocce ball court is available by reservation. Music in the Vineyards – For classical musical buffs, Music in the Vineyards has been featuring chamber music in intimate winery settings from Napa to Calistoga each summer for more than 20 years. Musical Picnics in Lyman Park –This series of free, family-friendly concerts is held in St. Helena’s charming Lyman Park from 6 to 8 p.m. every other Thursday evening through the summer. Guests are encouraged to pack a picnic dinner, or purchase a meal from one of the visiting food trucks, and bring low lawn chairs and a blanket. This old-fashioned evening of eclectic music sometimes also offers free ice cream for the kids. Napa City Nights – With terraced seating and beautiful views of the Napa River, the Veterans Memorial Park Amphitheater in downtown Napa is the perfect venue for an outdoor musical evening. Musical genres include jazz, rock, country, world, blues, pop and folk. Bring a blanket and a picnic basket and enjoy free entertainment for the whole family 6:30 to 10 p.m. every Friday all summer long. Blues, Brews and BBQ – This annual event occurs each August in downtown Napa with two live stages for blues performing artists near First and Main Streets. Admission is free and the event is open to the public from noon to 6 p.m.
Calistoga Concerts in the Park – This series of free concerts is scheduled every Thursday evening from 6:30 to 8:30 p.m. during the summer months through August in Pioneer Park in Calistoga. Families and friends bring blankets, chairs and picnic dinner to enjoy this annual Calistoga summer celebration. Adult beverages are allowed (for those 21 and over) and select, local wines are available for purchase, highlighting a different winery each week. For boxed dinners to go, head to one of Calistoga’s participating restaurants.